As an actor and comedian, Donald Glover has all the cred in the world, having written for 30 Rock and starred in Community. But as his alter ego Childish Gambino, he’s had to struggle for it more than, say, fellow actor-turned-rapper Drake, releasing a couple of so-so albums and making up ground with better-received mixtapes. Because the Internet, however, stands to be his first strong full-length studio album. Dazzling, woozy production and a guest spot from rising star Chance the Rapper help take “The Worst Guys” to new heights for Glover. 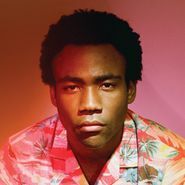 Thundercat and other producers also enliven “Shadows.” Glover’s rapping has steadily improved in both flow and content, as he carries a mid-album cut like “Sweatpants” with a jumpy cadence somewhere between Lil Wayne and Drake and odd vocal tics and production choices that are his own. And “3005,” his clearest vie for some of Drake’s emotions-heavy, pop-rap audience, really works, building up to its crowd-pleasing chorus with spare verses that rely as much on confession as humor (“I used to care what people thought/But now I care more,” he says). He’ll likely always have to content with haters knocking him for starting as a comedian, but now Glover can point to Because the Internet as proof positive that his multifaceted professional title can firmly include rapper, as well.